Earlier this year DSAOC was invited to submit a grant request to Covidien’s local office. The company is a global leader and best-in-class technology provider for specialists treating a wide range of vascular diseases and disorders. They also have a commitment to giving back to their community. DSAOC was thrilled to be one of the recipients of their 2012 grant cycle! Linda Brownell and her colleague Richard Flask from Covidien came to the DSAOC Center and presented the check to our DSAOC Board President, Janette Mattson, during our 0 to 11 Circle of Friends support and networking group. The grant will fund our hospital outreach and new parent support materials. They also provided some additional funding to support our teen/adult computer lab! 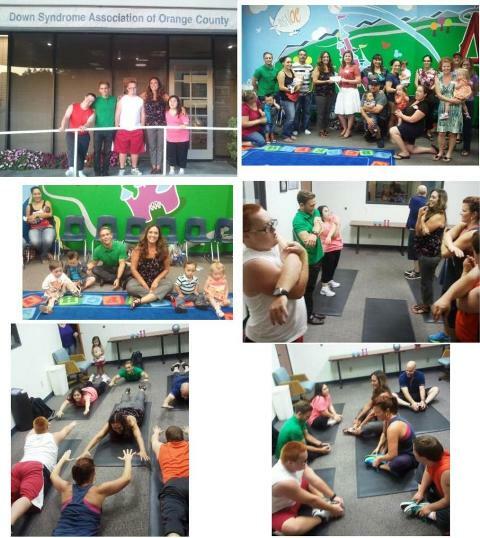 The night of the check presentation, some of our adults were here for our Fitness program. Linda and Richard were thrilled to join in! What a fun night we had with some great people representing a generous company. Posted in Uncategorized | Comments Off on DSAOC thanks Covidien!